Opis: The box of the original Core Set could only accommodate the first 3 sets (up through The Obligatory Cthulhu Set), so The Big Geeky Box was created to accommodate more sets. But The Big Geeky Box will eventually run out of space, especially when you sleeve all the cards. Now The Bigger Geekier Box was designed to hold even more sets than The Big Geeky Box. 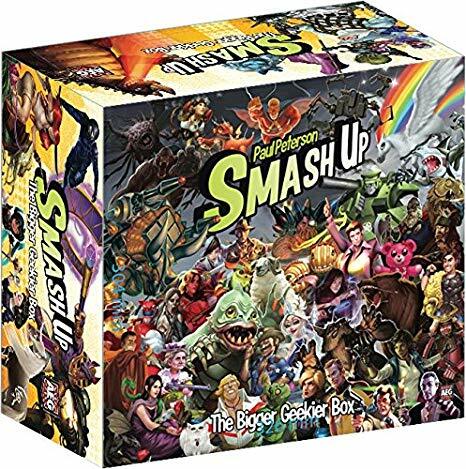 It has four long troughs that can hold dozens of decks each and a closeable token holder, the previously-released Geeks and Smash Up All Stars factions with their corresponding bases. Also, unlike the Big Geeky Box, this set contains with a comprehensive rule book compiling all the rules and card clarifications from all the sets created so far. The set also comes with dividers that name every faction made thus far and for Oops, You Did It Again. To accommodate partly full troughs, the box includes with foam bricks that can be positioned anywhere along the troughs and will remain in place.